"Wouldn’t it be cool if we could all access a dynamic facility that would stand out in its field as a sports and leisure leader?" Sports and Leisure is an essential part of any thriving community, town or city. When the all-important mix of facilities, offer, services and engagement works in synergy the result is dynamic and vibrant provision that becomes the benchmark for national standards. PH2O will encompass the already successful programme that Live Active delivers to the people and visitors of Perth City alongside new and exciting range of activities and sports. Picture an environment where all of us would train, play and work out alongside one another. Children learning to swim in the same building as our Olympic hopefuls are training; this is about inspiring people into becoming sports lovers, fitness fanatics and world class athletes. 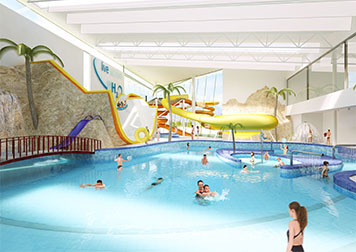 Picture a swimming pool with enhanced family water and improved dedicated training lanes, more ice skating throughout the year, Olympic standard curling facilities, a state of the art gym, large spacious classes and Personal Training programmes for everyone. Now add to this an outdoor facility that will deliver sky walks, a climbing wall and adventure play and you will begin to see our vision take shape. "Sports and Leisure is an essential part of any thriving city; with PH2O we will set standards in excellence and offer unrivaled facilities and support for people of all abilities and at all stages of life. "